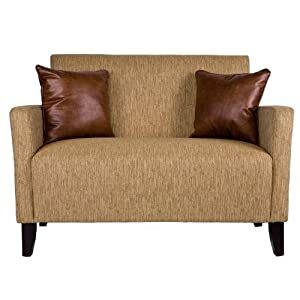 angelo:HOME Sutton designer Loveseat has a slightly flared styled arm and luxurious foam and polyester fiber seating for exceptional comfort. Designed by Angelo Surmelis creator of a new generation of Modern Classic furniture that combines modern lines with traditional details. This loveseat is covered in a textured papaya fabric and Angelo has included two decorative pillows. The solid wood frame is glued and corner blocked and extra thick high resilient back cushioning is filled with high loft polyester fiber ensuring total comfort. Luxurious foam and polyester fiber seat cushion maintains its shape and offers deep seating comfort. Extraordinary design at affordable prices. Innovative engineering and packaging design enable upholstery to be easily assembled in the actual room. Fabric is 100% polyester. Arrives at your home in one box. Instructions for assembly included; no tools needed. Seat dimensions: 48-inches long by 28-1/2-inches wide by 35-1/2-inches high.